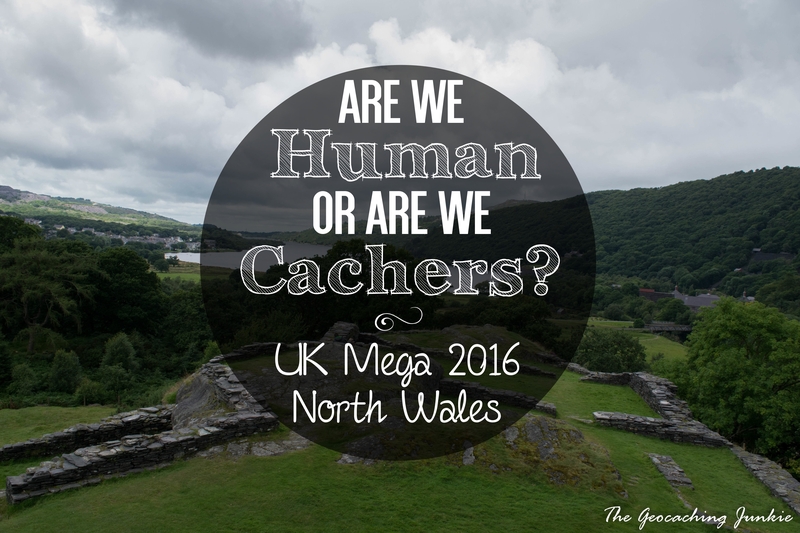 Are we human or are we cachers? Picture the scene: Friday night of mega week, Adam from UK Cache Mag wandering around the campsite with a questionable box of rum cider perched on his shoulder, sharing it with anyone who had an empty glass. I happened to have two empty glasses, since I was holding someone else’s when he appeared. 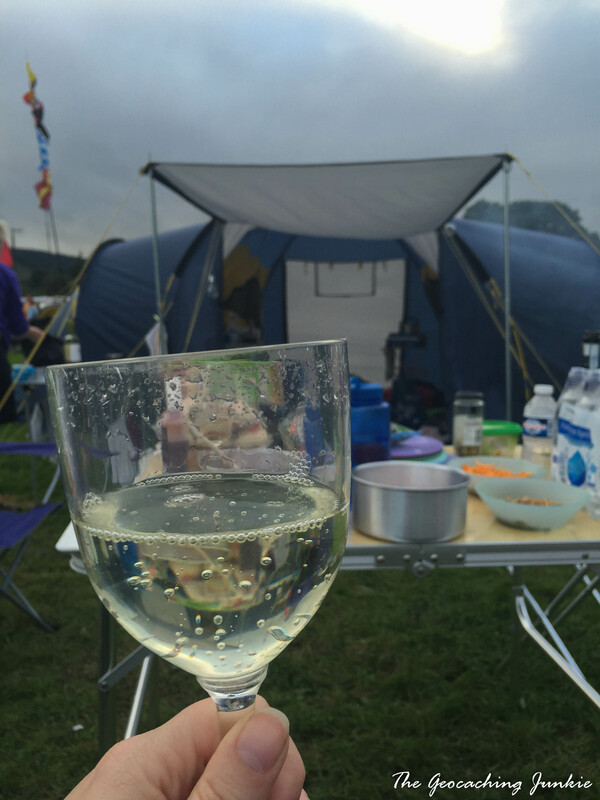 Two glasses later, I heard the song being belted out from the main tent at the campsite and I joined in. This was the best geocaching song ever. I’ve jumped ahead in the story though so I’ll rewind here. 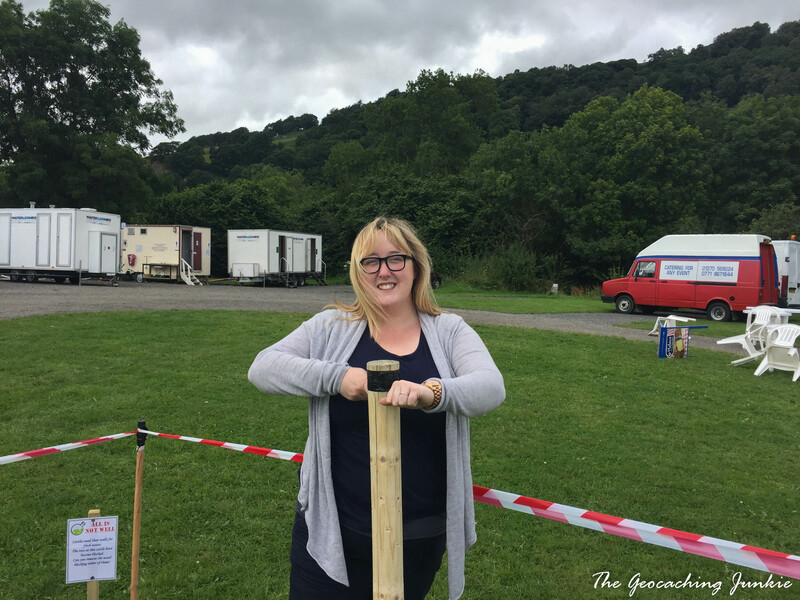 The muggle and I arrived to the mega campsite at Carrog, 8 miles west of Llangollen, where the mega event was being held on Wednesday afternoon. After checking in at the office, we headed to our pitch with hopes of getting the tent up. Though we were glad it wasn’t raining, we hadn’t been betting on the gale that was blowing through the campsite. We decided to wait for the rest of the clan to arrive, as we didn’t think we’d be able to put up the tent while ensuring it didn’t blow away. We took the time to explore and happened upon 8 of the 10 mega lab caches, so we kept ourselves busy doing them. 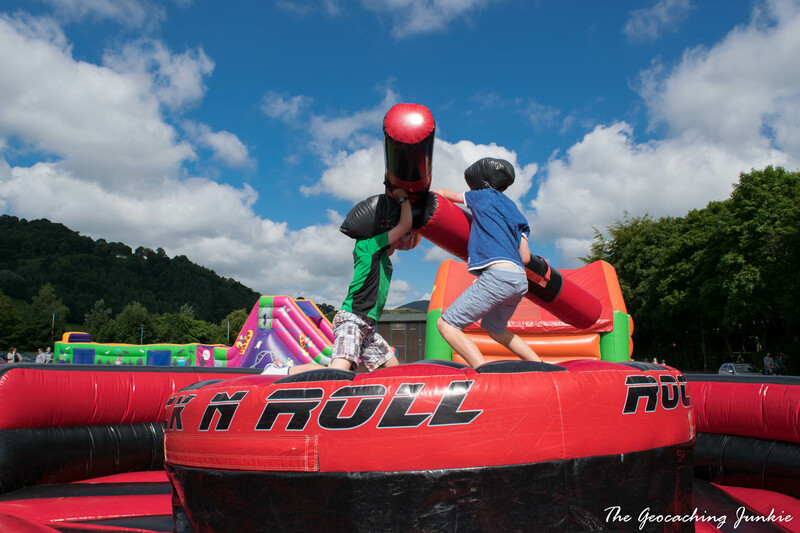 They were great fun for all ages and we thoroughly enjoyed them. The rest of the family soon arrived and we started to set up home for the next four nights. Amidst the tent-pitching, the photographer sent by the Sunday Times arrived so he ended up helping us put up the tent! I then spent almost two hours with him posing for lots of photos all around the campsite. He was bemused by the whole geocaching thing but didn’t think he’d be trying it for himself any time soon! By the time the photo shoot was over with and I was finished my phone interview with Dara from the Sunday Times, there was just time for one measly cache for the whole day, the chirp cache, A Small Travel Bug Hotel (GC6P1HW), which in reality was not very small at all! Afte the webcam and a brief visit to the event, the group split in to those attempting Snowdon (I was not in that group – maybe next time!) and the rest of us who did a tour of some must-do caches I had on my list. Hide and Keep (GCQXYT) had been recommended to me so we headed there first. 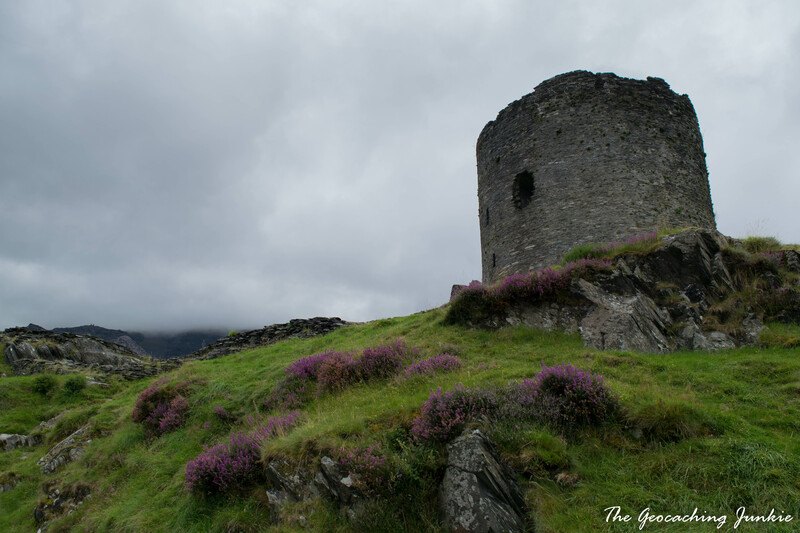 The location really made this one – a beautiful old ruined castle set amidst a blanket of green grass and purple heather. We could even walk up to the very top of the ruin, though my legs felt a bit like jelly when we got up there! 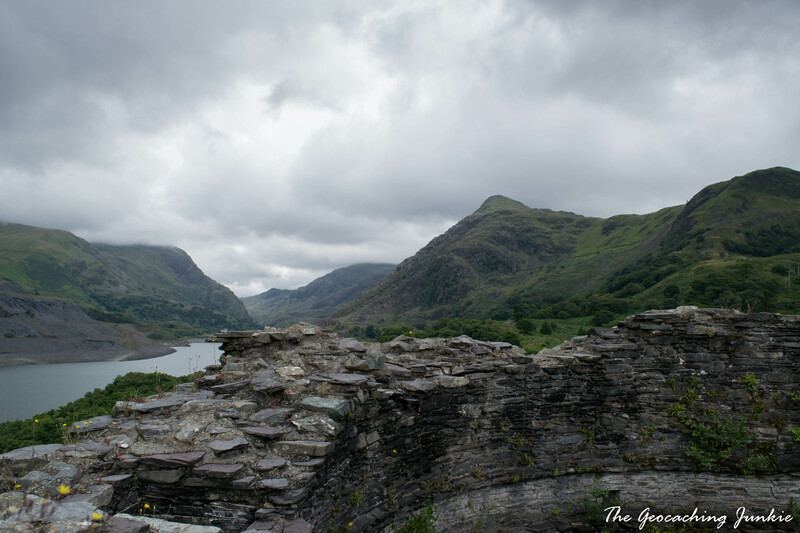 Before leaving Llanberis, we looked for what is probably most picturesque SideTracked cache I’ve found to date: SideTracked – Llanberis (GC2DYFR). 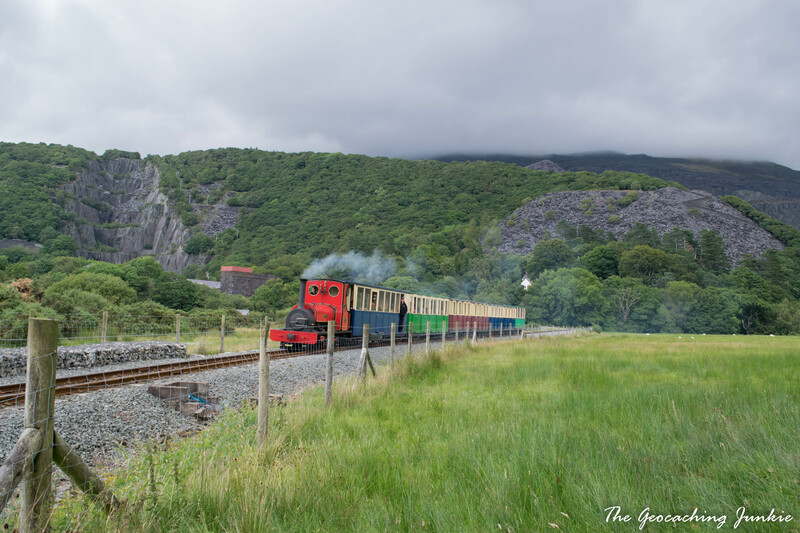 To add to the scene, we were treated to the colourful steam train choo-chooing past after we had replaced the cache. 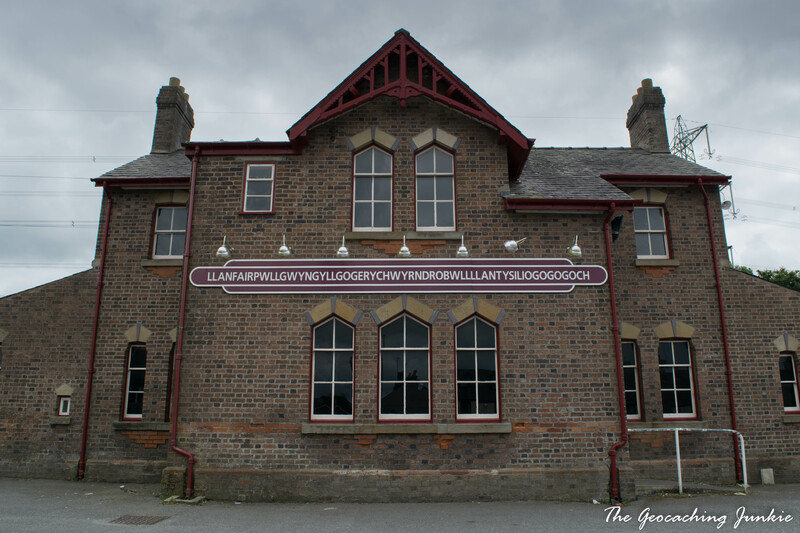 It was soon time to move on from Llanberis and head further west to Anglesey and the large village of Llanfairpwllgwyngyllgogerychwyrndrobwllllantysiliogogogoch. 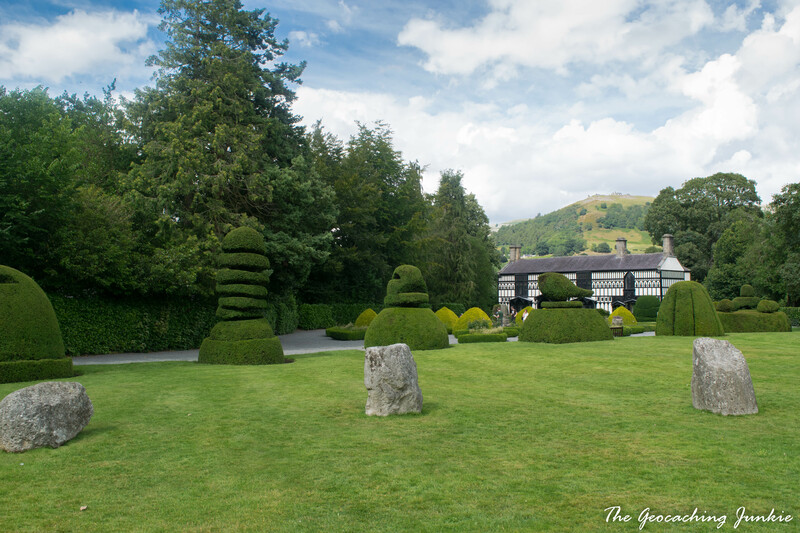 With 58 characters, the place name is the longest in the UK and one of the longest in the world. In English, the name translates as St. Mary’s Church in the Hollow of the white hazel near to the rapid whirlpool of Llantysilion of the red cave. You can hear how it’s pronounced on the Wiki page here. We picked up the cache Llanfair.P.G. Village Vexation (GC1519D) right on the platform at the railway station. 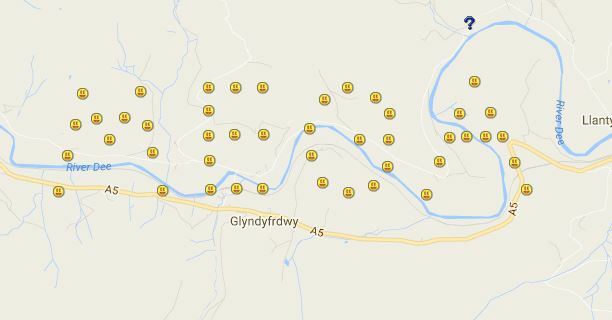 The cache name utilises the shortened version of the place name, Llanfair.P.G., maybe because geocaching.com has a character limit for cache names! Next, we headed straight for Bala with just one cache in our sights: Kate’s BINARY challenge No6 & MISSION IMPOSSIBLE! (GC64BH0). Everyone thoroughly enjoyed this one and we let my niece do the honours with the remote control as she didn’t know how it worked. You can watch the reaction in the video below! 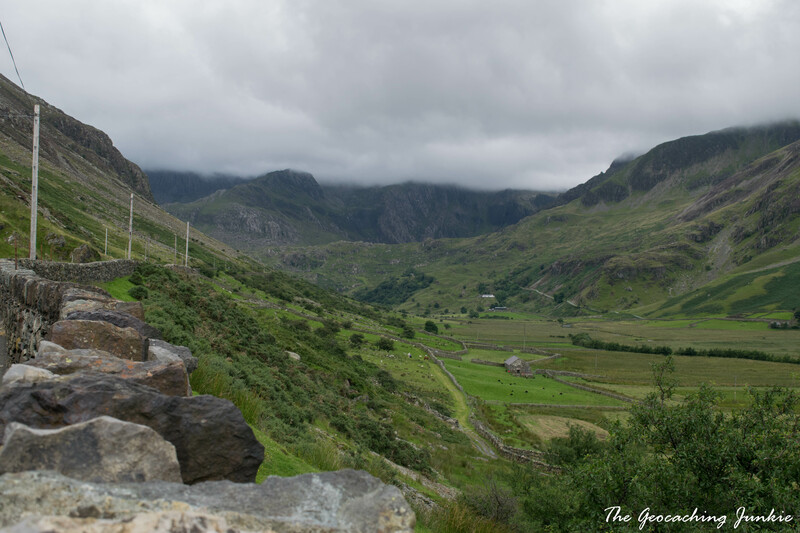 An enjoyable drive back through Snowdonia with a few stop offs for obligatory photos and we were soon back to the campsite in Carrog. The day’s caching was far from over. 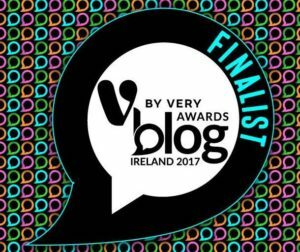 ‘Mega’ geoart had been published weeks before the event and a group of Irish cachers banded together to solve the puzzles. 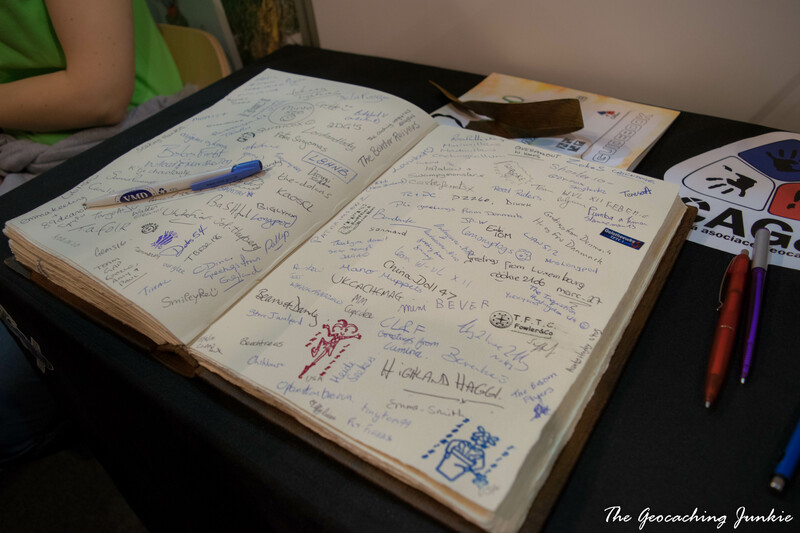 Thursday afternoon was the perfect opportunity to sign the logbooks! 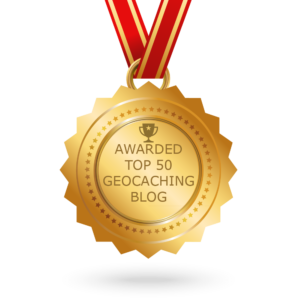 We met quite a few cachers on the way around and were lucky to get around all forty five caches, though it did take longer than I had predicted. 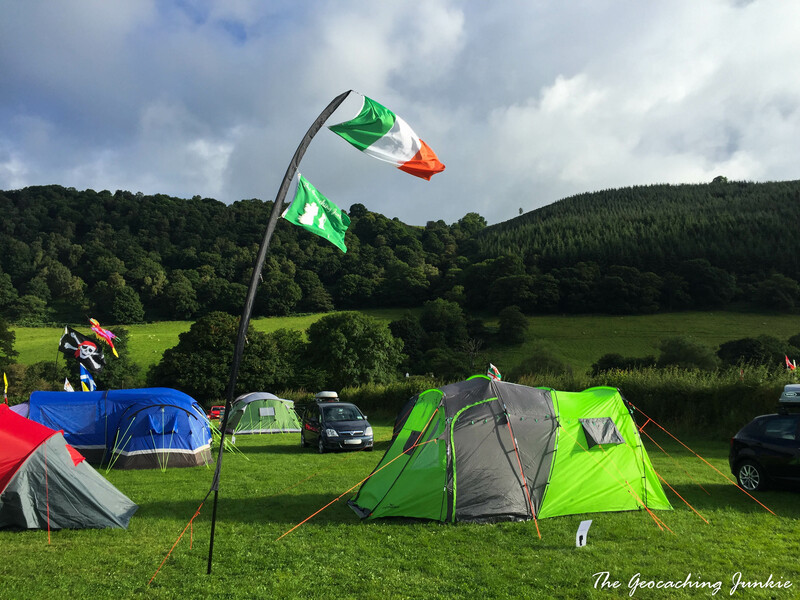 After a cache-packed day, we spent the evening enjoying the festivities at camp for the Sombreros After Snowdon event (GC6ATF4). On Friday, we decided it would be a good idea to attend the GPS Maze (GC66HYC) to avoid the crowds on Saturday. 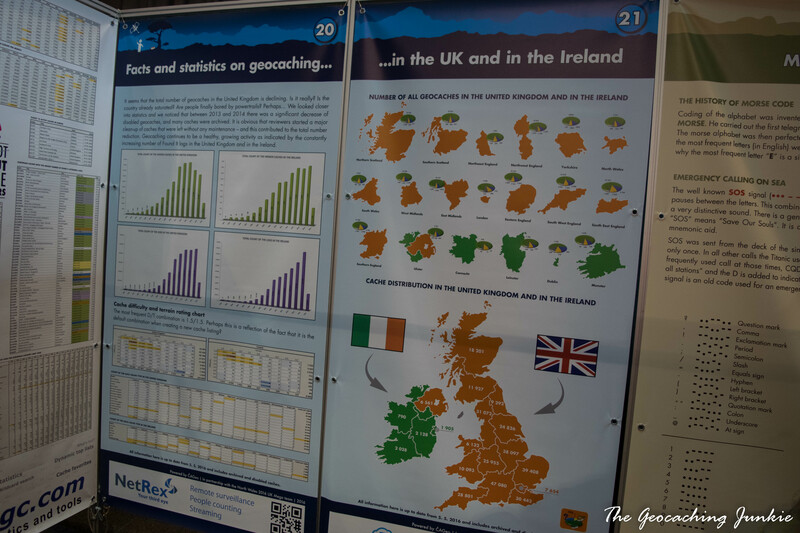 The maze was localised in places to include lots of interesting information about geocaching in the UK and Ireland. There were also ten lab caches to be found as we made our way around. My favourite component was the night caching section, which was all in the dark and had various puzzles you needed a torch to figure out. We made it through the maze and signed the logbook at the end, which was, of course, trackable! After a quick pit-stop for coffee, we started along the canal to grab some of the LCT series of caches. The weather was perfect for it and the walk is well worth doing. 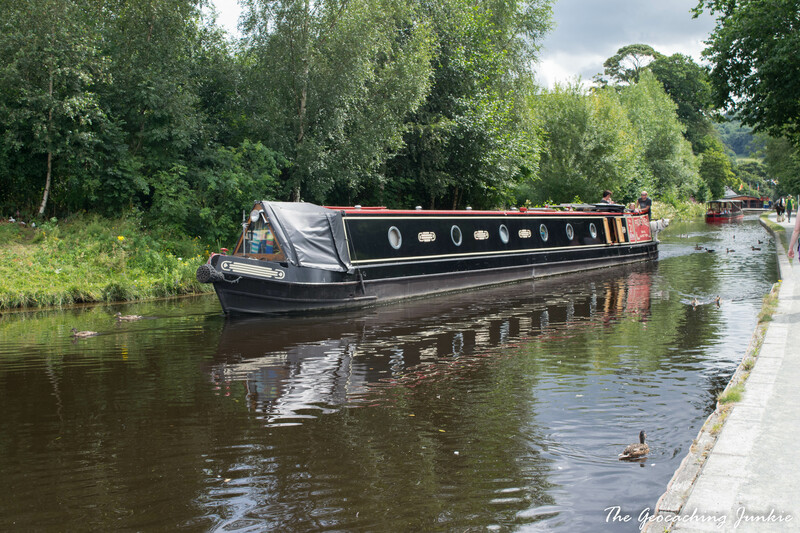 The passing barges made me want to go on one for a holiday sometime! 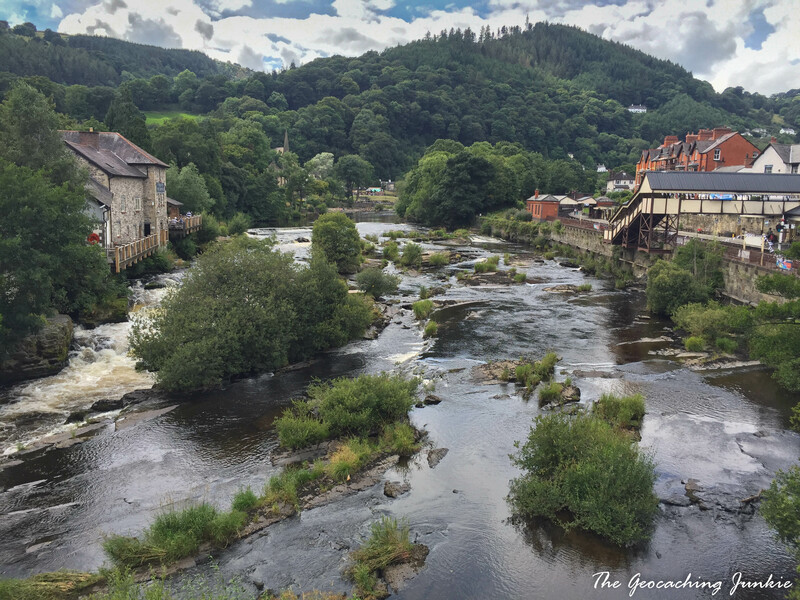 Our first walk in to Llangollen followed, allowing us to pick up some more caches, including a fun wherigo Over the Bridge (GC6MCCR), which presents the ‘classic caching conundrum’: find the cache, keep hold of your beer and don’t get eaten by the tiger! 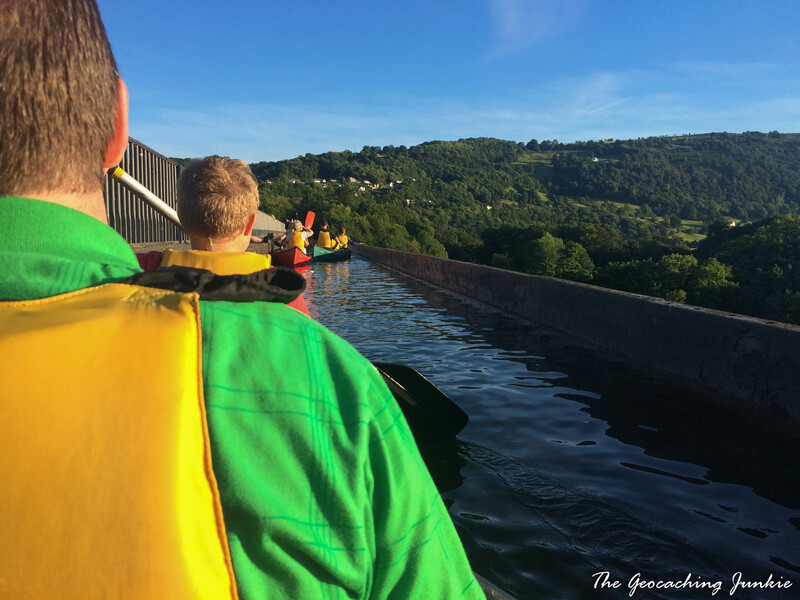 Friday night was one the week’s highlights: the entire family went canoeing on the Pontcysyllte Aqueduct. 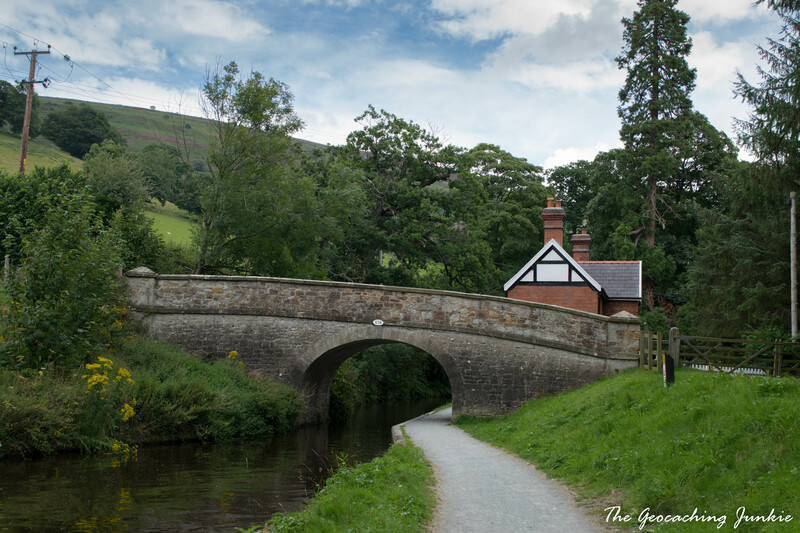 The aqueduct – a World Heritage Site – was completed in 1805 and carries the Llangollen canal over a valley of the River Dee. 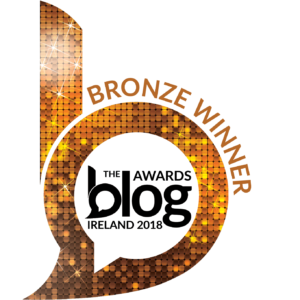 There were three of us to a canoe and I sat at the back, which in hindsight probably wasn’t the best place to sit as I was nervous and it wasn’t the most stable position. 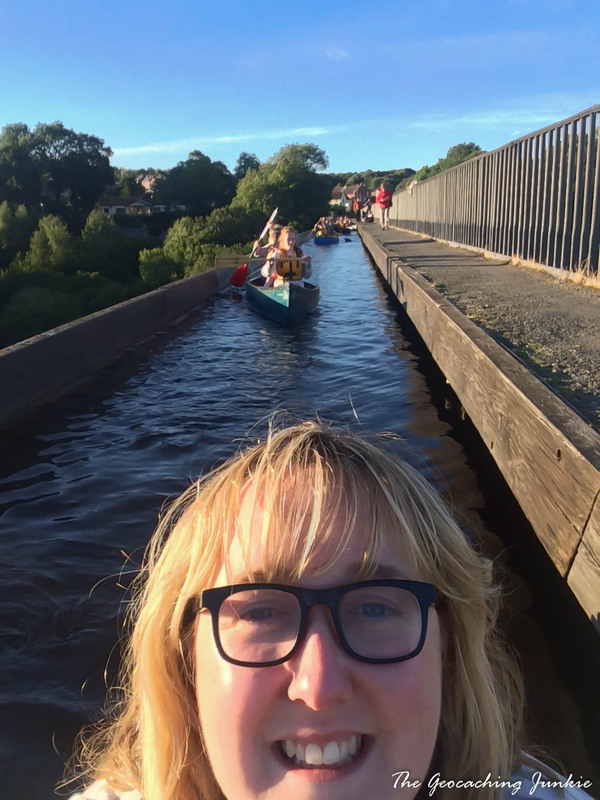 There is no fence along one side of the aqueduct and the drop is 126 feet to the ground below and our health & safety adviser from TNR Coaching recommended that we not make bad life choices. Sound advice. While I was anxious, I was very glad I had done it once all was said and done. It was an experience I won’t forget for a while. UK Mega day! The Llangollen Pavilion was due to open at 10am but I needed to get there early to be in with a chance of obtaining a Dragon Egg geocoin! 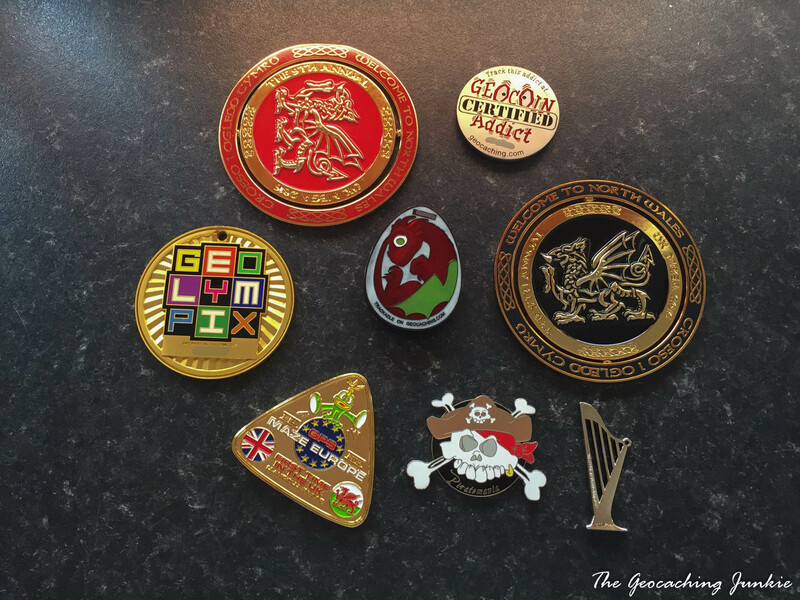 I have amassed quite a collection of geocoins but CW88’s Dragon Egg was one that kept alluding me. I bid on several eBay auctions to no avail. 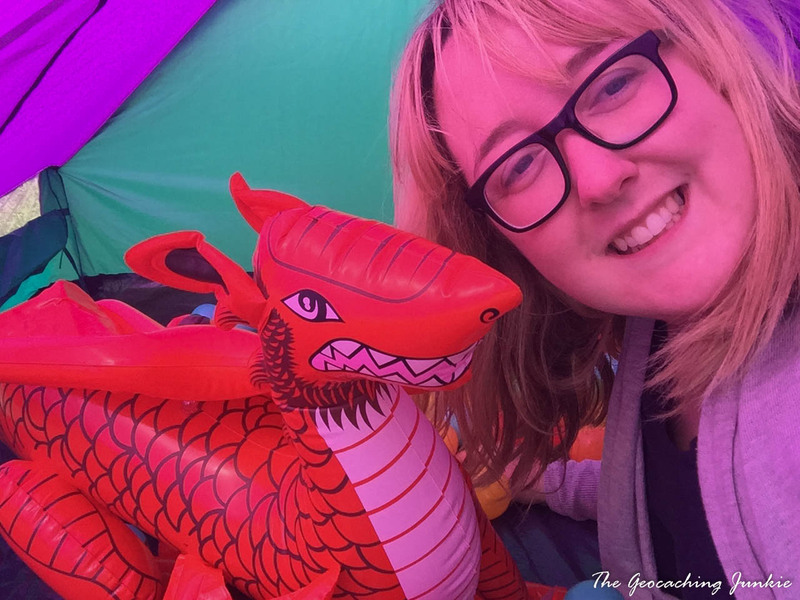 When I saw this special, limited Welsh Ddraig edition would be on sale on mega day, I decided I’d have to be there early to be in with a shot of buying one. We were in the queue by 9:15am and were 5th in line. 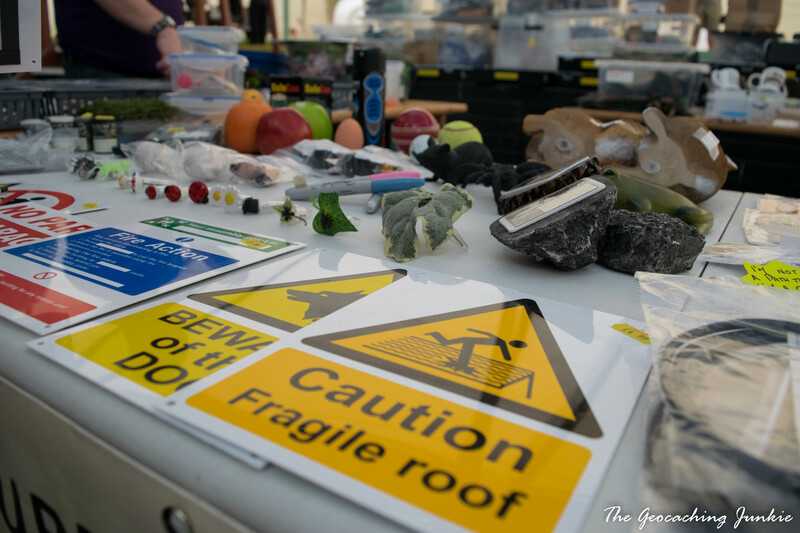 When we were allowed in, and I arrived at the Geocacheland stall, I was shocked to hear that I got the last one (apart from the display, which I assume was sold to the person after me). But I got one and I was so relieved, and feeling incredibly lucky too, as there were only forty of this edition made. It now has pride of place in my collection! 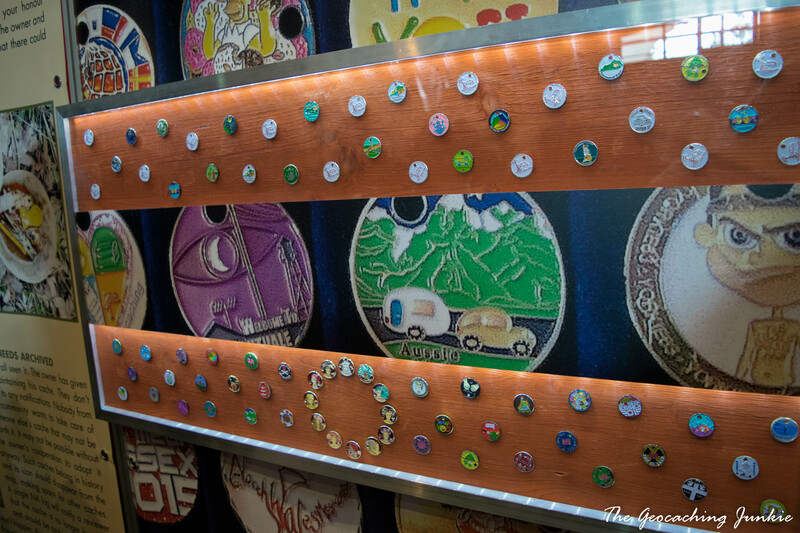 We spent a little time milling around the pavilion, checking out the wares (yes, I bought more coins), signing the logbook and going through some of the many, many trackables. There was a fantastic bouncy area for kids outside and the weather was glorious. At 12:23pm, we were treated to a fly past by the RAF Red Arrows. 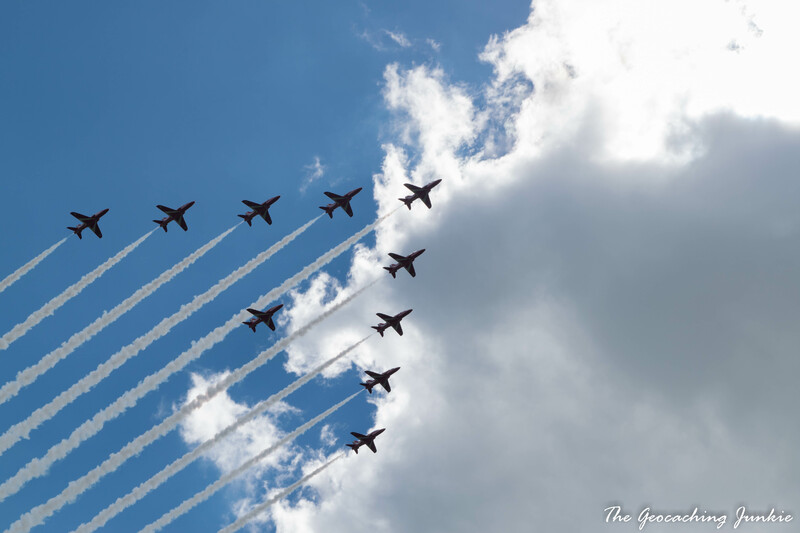 A mega committee that can organise a fly past by the famous Red Arrows is definitely one to be applauded! I spent a few minutes chatting to lackey Sean just as we were both leaving the pavilion, too. 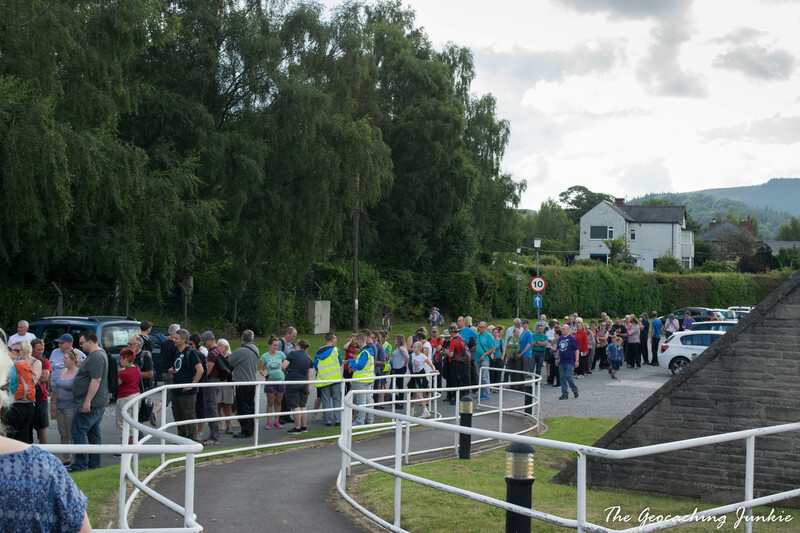 After that, we decided to move on and leave the throngs in Llangollen. 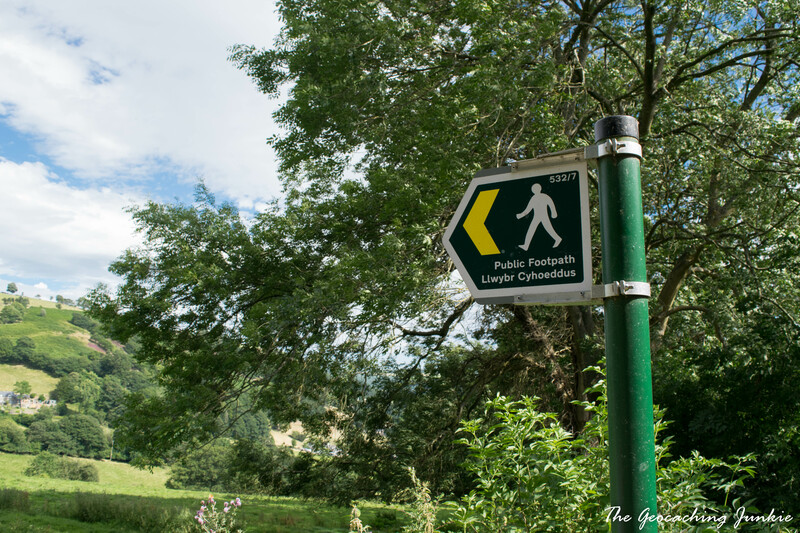 We headed for the tiny village of Glyn Ceiriog to do some Church Micros and the Bears Walk caches. On our last night, there was just time to put our feet up and reflect on an amazing few days! 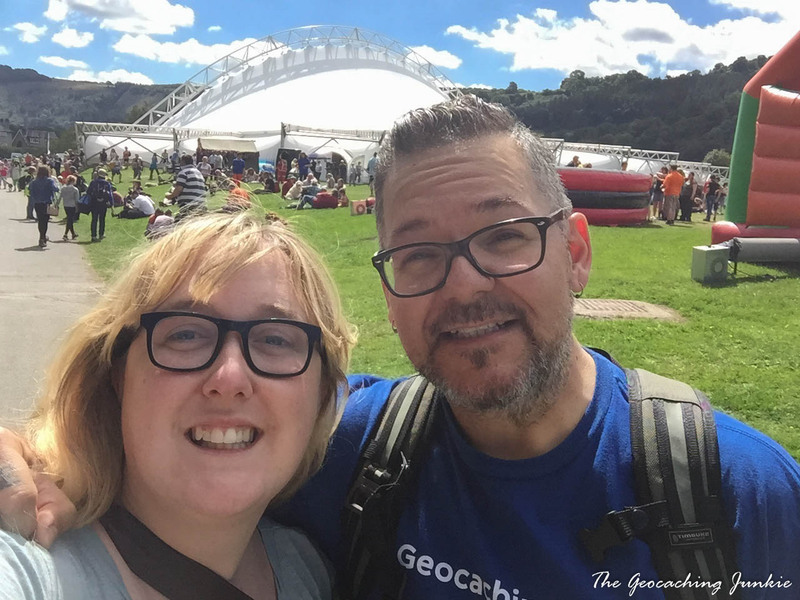 We enjoyed the entertainment put on in the main tent at the campsite and got to bed early before packing up the next day and heading to Holyhead! A massive thanks to the North Wales mega committee and also huge congratulations for over 1,250 attended logs as I write this and many more people besides in attendance on the day. 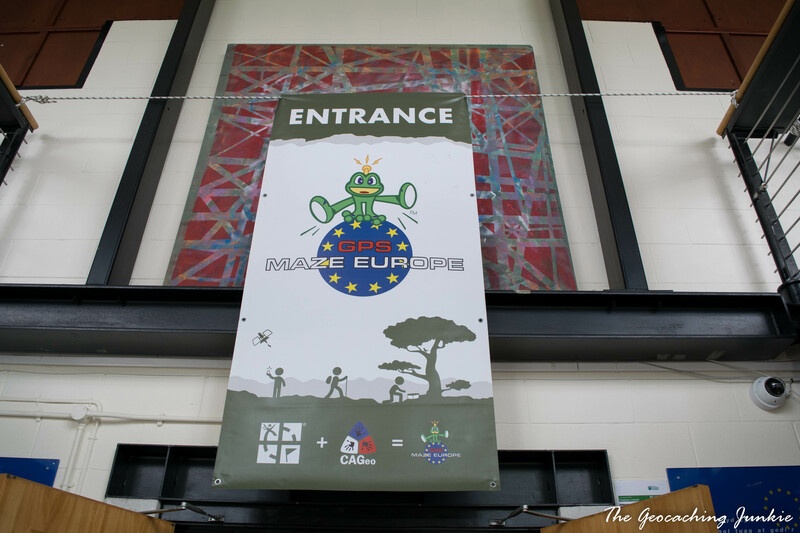 We all thoroughly enjoyed the week, thank you so much for volunteering your time to showcase your lovely part of the world! 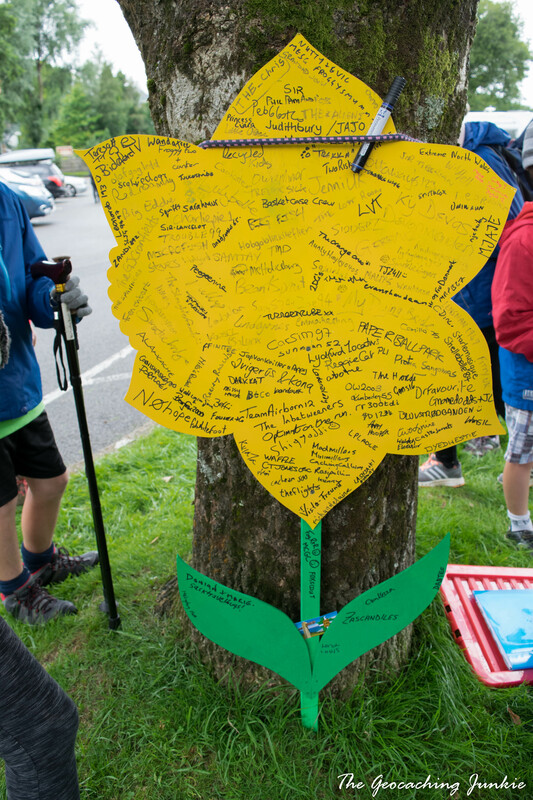 Were you at the North Wales mega? What was your favourite part? Wow! What an amazing trip. That really long village name really made me laugh. I am SUPER JEALOUS that you got to attend the GPS Maze. They don’t have them here in the US anymore and I wasn’t geocaching when they did have them. I hope to get that special icon someday! 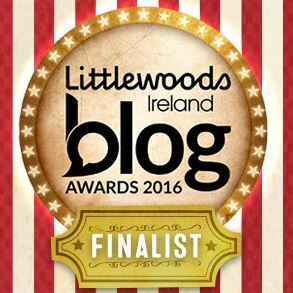 You’ll have to come to Europe to see the maze – I wonder where it will be next year? They also have it in Canada. It was recently in Nova Scotia. They haven’t posted a new one yet though.